Porous Media Transport Phenomena covers the general theories behind flow and transport in porous mediaa solid permeated by a network of pores filled with fluidwhich encompasses rocks, biological tissues, ceramics, and much more. Designed for use in graduate courses in various disciplines involving fluids in porous materials, and as a reference for practitioners in the field, the text includes exercises and practical applications while avoiding the complex math found in other books, allowing the reader to focus on the central elements of the topic. Covering general porous media applications, including the effects of temperature and particle migration, and placing an emphasis on energy resource development, the book provides an overview of mass, momentum, and energy conservation equations, and their applications in engineered and natural porous media for general applications. Offering a multidisciplinary approach to transport in porous media, material is presented in a uniform format with consistent SI units. 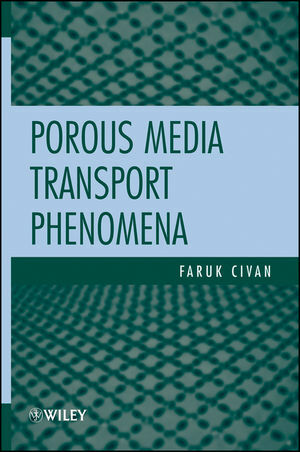 An indispensable resource on an extremely wide and varied topic drawn from numerous engineering fields, Porous Media Transport Phenomena includes a solutions manual for all exercises found in the book, additional questions for study purposes, and PowerPoint slides that follow the order of the text. FARUK CIVAN is a Miller Chair Professor in the Mewbourne School of Petroleum and Geological Engineering at the University of Oklahoma. He has been teaching graduate courses on porous media for twenty-five years, and has published over two hundred and seventy journal and conference papers, a book, and several book chapters.